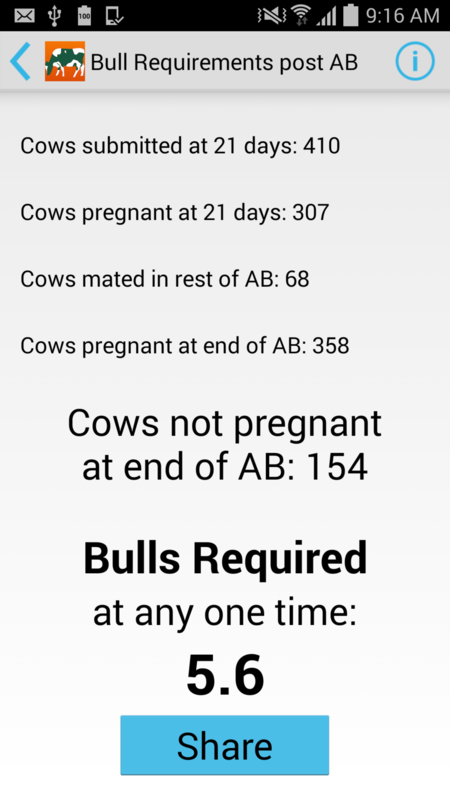 This app will calculate the approximate expected number of cows that are not pregnant at the end of the AB period, and then the minimum number of bulls required at any one time to cover them at 1:25. You can then share the result by email, SMS or copy to the clipboard. These calculations are based on number of cows, the expected 21 day submission rate in precent, the expected conception rate in percent, and length of the AB period in days. It is recommended you rest your bulls for at least 24 hours, so you should have at least 2 teams of bulls. The answer is for "Minimum bulls required in the herd at any one time", so double the answer for 2 bull teams. The bulls required is based on a 3 percent requirement, plus 1 bull for safety. The final bull requirement number may not be adequate if any cows have been synchronised (either by cycling synchrony or anoestrus cow treatment). Consult your Vet or Farm Consultant if you are unsure.